As soon as I knew that we were coming to Rome, the very first thing that popped in my head was : gelato. And I needed to find THE gelato. Okay okay, now architecture and everything is wonderful but seriously guys, ice cream making in Italy is like a form of art! It is a form of art. Period. 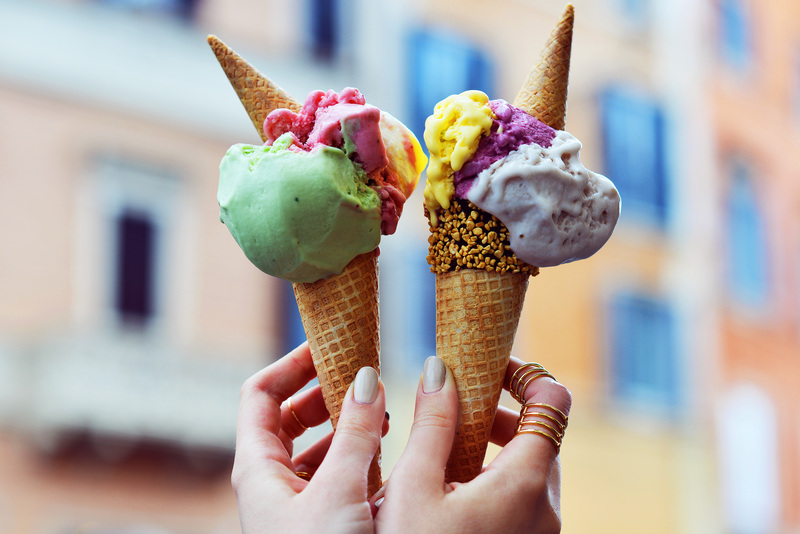 Naturally, I browsed the web for hours trying to find THE list of the best gelato places in Italy, you guys were so kind to send in some names, but the best was to be there, explore and take the time to really try and appreciate each place. Of course, it was also a super excuse to indulge with tons of delicious creamy goodness. I think we had probably 4 ice cream cones per day. Which is… really bad obviously. We were on a sugar rush all day basically. But seriously, this was just the best thing to do while in Rome! We even created a #gelatoquest hashtag on Instagram! So guys, find bellow my favorite places for Gelato in Rome by order of preference, and next time you’re in Italy, get yourself on one of those ice cream quests. There’s nothing more fun to do than that! Don’t ask your taxi driver to bring you there as this little gelateria is located right in the middle of a pedestrian street with tons of absolutely adorable little shops full of antiques and pastries. This gelato spot is one of my favorites not only because the place by it’s self is so nice (I especially enjoyed the fact that it felt less touristic than the others) or because it had a fabulous diversity and originality of flavors, I loved above all the quality of the ice cream which was truly exceptional. I tried three flavors and highly suggest their Fior Di Latte, which is always a good classic but can be very easily plain and un-interesting. This one was researched, delicate, voluptuous, like a cloud that sits on the tip of your tongue. + you can easily grab a seat at one of their cutie little tables and even have a wi-fi access to post an image of your gelato! All win for me! This is probably one of the smallest ice cream places in this list, but I’d say it’s also one of the best! The proof is that even if this ice cream shop isn’t exactly in a shopping area, it’s always full and the ice cream jars are getting empty very quickly. There’s a big choice of flavors, you got the classic and some more original ones, the price is perfect but the quality above all is really amazing. I remember enjoying the pistache flavor! Here’s the perfect organic version for all ice cream lovers! If you’re gluten intolerant like me and dying all the time because you can’t eat the cone, then this option is perfect for you because they do special GF cones!. The gelato here has less sugar and you can definitely feel it. It’s much healthier than a regular ice cream but it still is really delicious. The variety of flavors is stunning and I highly suggest the peanut flavor which isn’t too sweet, but still kind of feels like frozen peanut butter. The best basics. Here, you won’t find a lot of choice or originality in the flavors. What you’ll find here are the best versions of all the classic flavors, like chocolate, strawberry or fior di latte. If you’re a chocolate fan then this might be the place for you as they also have an entire conner dedicated to that! Last but not least, Giolitti is the place everybody has been telling us about! So of course we ended up going there the first day and I fell in love with the pistachio flavor. I feel like the choice was great but Giolitti deserves only the 5th spot because it was way too touristic, more expensive than expected and we couldn’t even have a seat without ordering a coffee. Other than that : the ice cream is worth your while! OMG, these ice-creams are so cute ! aww this looks so delicious! Good looking has ! yummi! This post is great! I don't know if you read my comment but yesterday I was asking you for this post in yoru comment section! ;) We are planning a trip to Rome mext year for our anniversary, so this post will really come in handy! Thanks for the info, Kristina. Adding them on my list for my trip to Rome. Gelato in Rome is so delicious! I'll be heading to Rome this Sunday and I'll definitely visit some of these places. Thank you for the recommendations. It's the first time I visit your blog but I already love it :) Have a nice day and good job with your blog! You're killing me with this post! I live for ice-cream and especially the Italian one! I've been waiting for a long time to compliment your wonderful team! You are both so fresh, your creations are so beautiful and addictive :) Wish you the best of luck, may you continue to have the good vibes to surround you, always! As for food...Rome is addictive too. Personally I liked Rivareno very much, they also keep their gelato in covered stainless steel containers. I have a top of gelaterias for Florence, for when you are there if you like, I outdid myself eating sometimes only gelato for a day. I'm an Italian girl living in Belgium and I'm glad you liked my home country so much. Craving gelatto so hard right now. Looks delicious! i lived there for a year and found that Old Bridge Gelateria was incredible! don't let the english name fool you - this place is so legit and there's never a line with fewer than 30 people. it's worth the wait! Very usuful information if I go back to Rome someday! I still desperately want to try gelato! Reading through this just makes me want to go to Rome again for ice cream! Rome has the best ice cream!! Ahhhhh les glaces de Rome ! J'espère que tu as gouté celles de la gare de Rome, j'avais dépensé environ 50euros dans les glaces à l'ananas là bas (avec des morceaux d'ananas et tout ça) c'était tellement délicieux !!! love!!! Awesome idea for a post!!! Pour toutes les fashionistas! Viens visiter mon e-shop: Kim&Zozi, Spektre, Sock Therapy, By Nord, Art, Déco, Mode, Champagne!!!!! I actually enjoyed gelatos in Florence the best! Thanks for sharing! thanks for sharing, I am going to check these places out next I am in Roma.